We've been keeping warm at home. Vince and Edda had a scheduled day off of school on Monday and today (Tuesday), the snow was coming down, so a snow day today. I trudged off to work both days, leaving Yvonne at home to watch the kids. 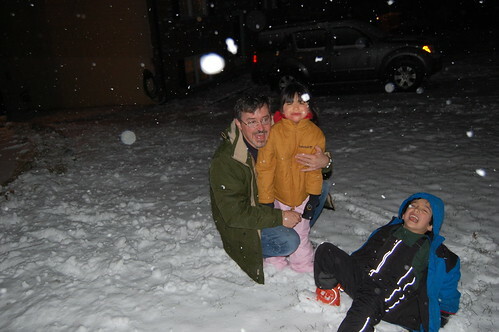 After both Jeremy and I came home, we went out to play in the snow, kind of. We don't have proper boots for Edda, so we put her feet into some old rain boots which I think were a little too small. Not an ideal situation. We miss the snow. It was 67 yesterday when we woke up and by noon down to 40 then an ice storm last night and now warm again and tonight 28. Even for Texas this weather is crazy. Keep those photos coming. We love them. Day 3 - no school. Put on your party shoes. Took the day off work.